Everyone knows that apple-picking, and the inevitable fact that you have about 10 to 20 pounds more than you know what to do with, involves dessert-making in some form or another. Now, normally you'd expect a pie, maybe a crisp (HEAVENS), possibly even a batch of lopsided dumplings. Are there any other kind? Oh no. Not this time, we said. We need something on the slightly unconventional side, something with a funny-weird name (have you ever had a buckle? a grunt? a SLUMP?) -- so, as per the King Arthur Flour Baking Companion's suggestion (this encyclopedia-sized book, originally bought for the elusive Banoffee Pie recipe, covers it all, from bagels, to the perfect pie crust and everything in between), we went the route of the pandowdy, a deep-dish spiced apple dessert known for its molasses and rich crust. So despite the big unknown of pandowdy, we figured it would be pretty damn difficult to go wrong with fresh Granny Smith apples, cinnamon, etc. You get the picture. It's time to preheat your oven to 425 degrees. 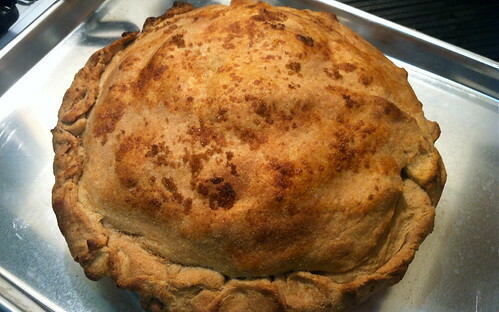 To get started on this traditional American dish (which dates back to the 1800's, so claims Arthur), which is said to be a cross between a pudding and a pie, follow your favorite piecrust recipe for one double-crust 9-inch pie. 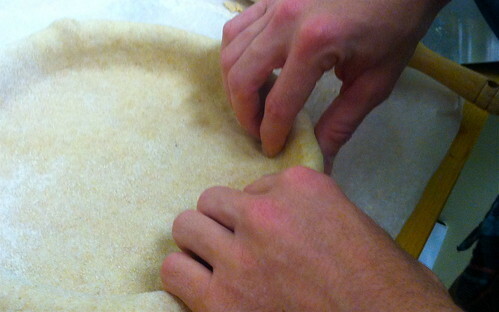 We just followed Arthur's recipe for a medium-flake piecrust and substituted whole wheat flour for regular white. 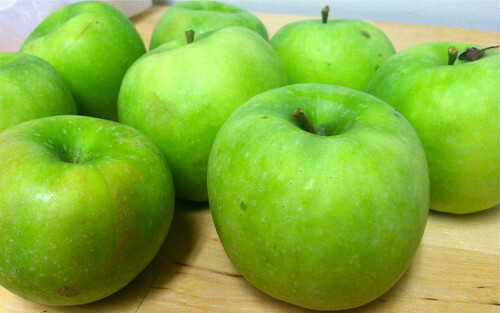 While cute Colin made sure the edges were all neatly tucked, I was hard at work coring and peeling our apples. You will need 7-8, preferably on the bigger side, or about 9 cups in total. 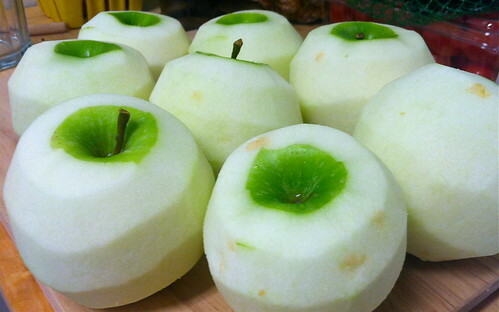 When they're all peeled, you can cut them into quarter-inch slices. 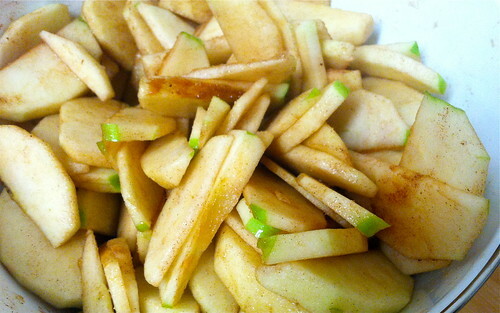 In a big bowl, toss your apple slices with 1/2 cup granulated sugar, 1/4 teaspoon salt, 1/4 teaspoon cinnamon, and 1/4 nutmeg. I admit I snuck a slice or two (or five) when they were in this state. Sooo good. 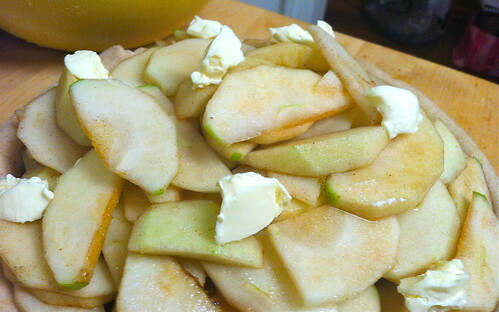 Scoop your apples into the bottom of your pan (or casserole dish, or really any ovensafe dish you have handy). Next, mix together a quarter cup of water with a half a cup of either molasses or maple syrup. (We went syrup!) 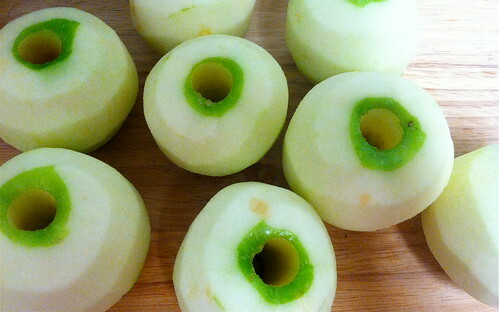 Pour this mixture over your apples. Then dot with three tablespoons of butter, cut into bits and evenly dispersed. 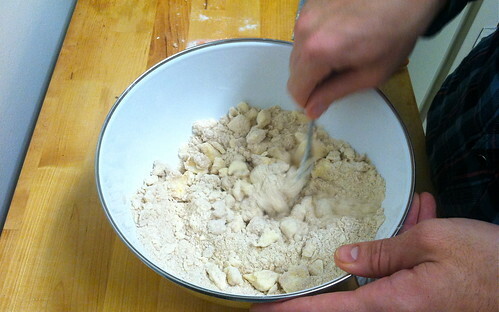 It is now time to roll out your second piece of dough (if you haven't already), and fit it over the apple mixture. 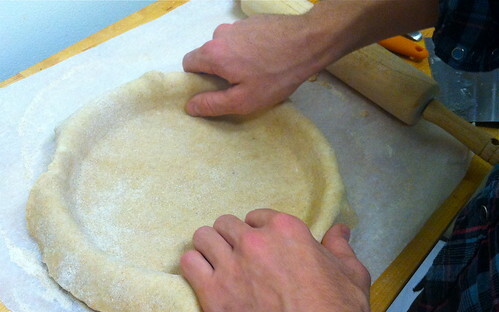 Brush the edge of the bottom crust with milk, and squeeze together the edges of both crusts. 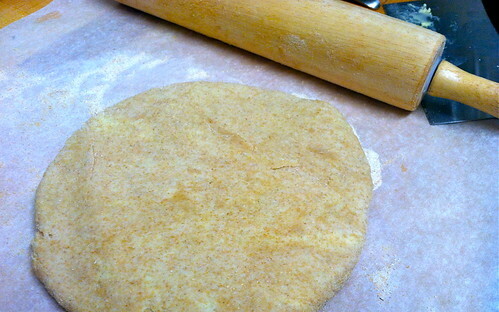 Also brush the top crust with milk, and sprinkle with sugar, if desired. We desired, as you can see. 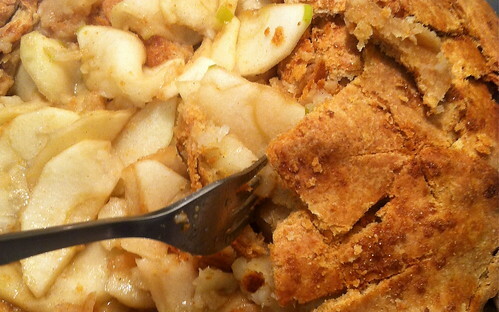 So, I know what you're thinking: that looks an awful-lot like a plain ol' pie. And, you're right. It totally does. So if the main thing that separates the pandowdy from the pie is the shape of the pan in which it's baked, well. Beats me why we don't just call it all by the same name. 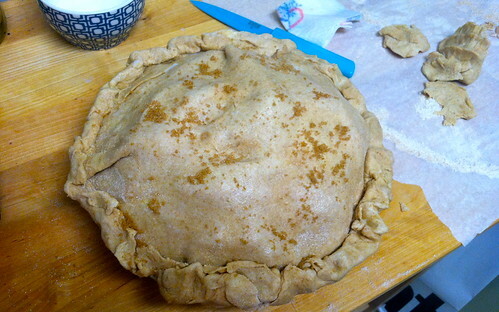 However--there is one final post-bake step when things get a liiiittle crazy, and a little more pandowdy-ish. Hang tight. Bake in your oven for 45 minutes, then decrease heat to 325 degrees and continue to bake until crust is "well browned." King Arthur notes that the initial forty-five may be enough to complete this mission to brown, but that each oven is different. Thanks, Art, you're a pal. I know, I know. Still a pie, still a pie. BUT, we're almost to the good stuff. Let your pandowdy cool for about five minutes upon removal. Then! Take a knife and "slash, in a random pattern, all the way through the pandowdy. With a fork and spoon, gently lift pieces of crust from the bottom and submerge pieces of the top crust; in effect, you're really messing the whole thing up." Well, I'll say we are! But it was actually sort of, well, fun. You get to bake a fake pie, play with it, then eat it. Who's complaining? 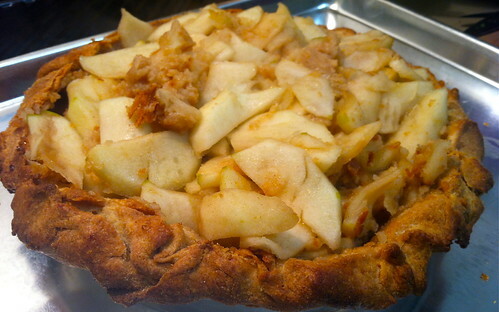 The bottom pieces of crust are super sweet from the baking, and the top pieces (now submerged) begin to absorb what's left of your syrup/molasses mixture, all while incorporating with the cooked apples, bringing it to that pudding-texture earlier described. All in all, a successful dish, and one we will have to try again when the proper (pandowdy) pan is available.